On Apr 1st 1945, The Perth Regiment was authorized to become a Scottish Unit. Hostilities had not yet ended in NW Europe yet plans were being made for the postwar organization of the unit. 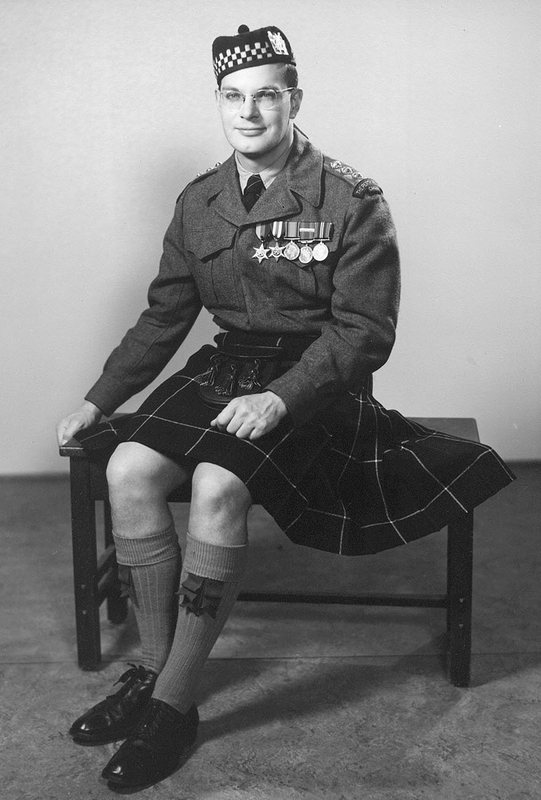 The Perth Regiment had been affiliated with the with the Scottish Cameronians since 1930, so it was logical for LCol Whyte to request and receive permission to adopt many of the dress regulations and traditions from the unit. The one major exception was that the Cameronians wore trews and the Perths would become a kilted unit. With this adoption of Scottish traditions, it was decided that some changes to the regimental cap badge would be in order. 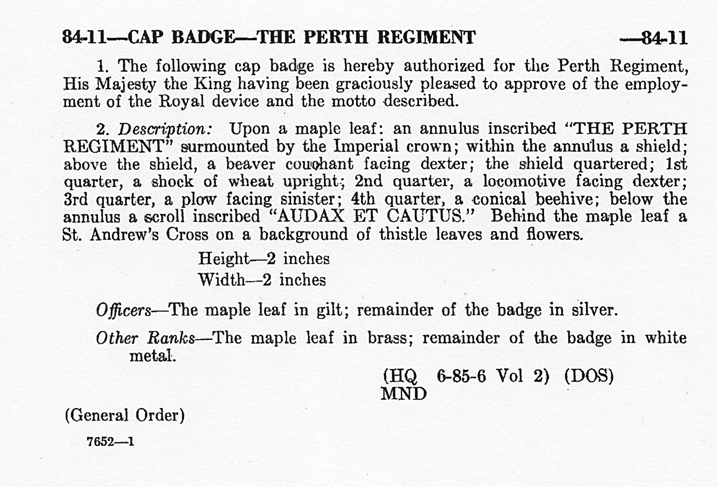 In July 1945, Capt Dent had designed the new badge which it appeared in the 2nd edition of “The Perthonian”. The idea was to take the existing regimental badge in its current design and simply superimpose it onto a St Andrew’s cross. 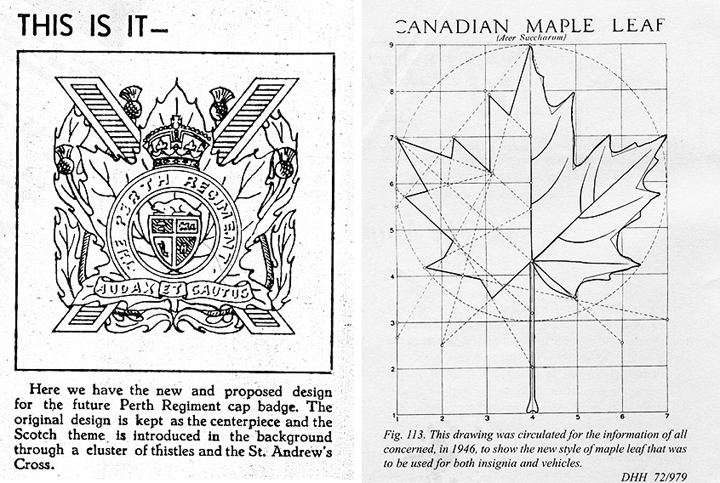 During the course of the war, it had come to the attention of CMHQ that there should standardization in the design of the maple leaf being used on badges and vehicles. Up to this point, the use of the maple leaf in badges and vehicle markings had lead to some unique leaf designs some of which looked nothing like a maple leaf. Any new badges would have to adhere to the newly approved leaf design. 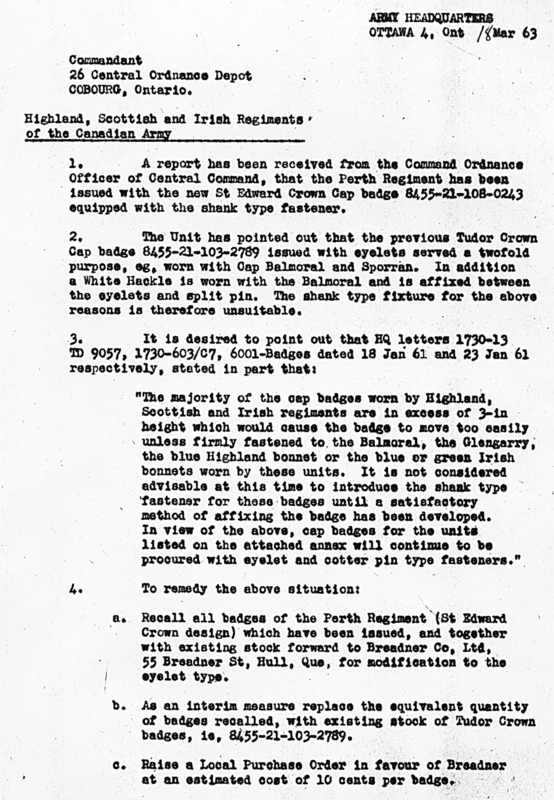 In the opinion of the regiment the proposed badge was an alteration of the existing badge, not an entirely new one. For that reason, the desire was to continue with leaf design of the old badge. That sentiment was not shared by NDHQ and the initial design was declined. This did not sit well with LCol Whyte Perth OIC who continued to press the case, often soliciting support from local politicians and former Perth commanding officers. This continued for over two years but finally the Regiment realized they weren’t going to win and adopted the new leaf design as part of the badge. 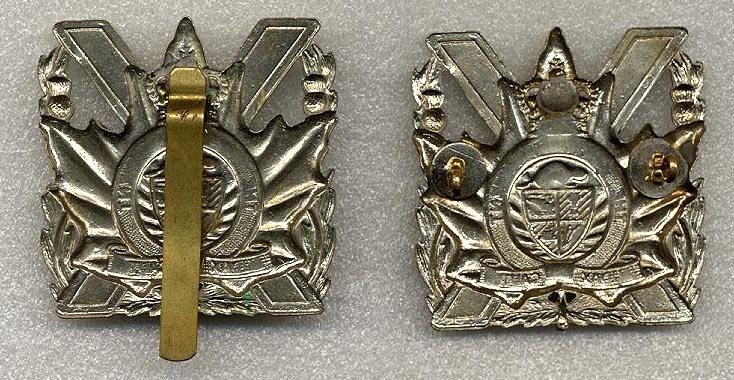 While we have seen many variants of the previous 1920 pattern cap badge, the post war period saw a single variant for the 1948 pattern other ranks badge. These were made exclusively by Scully Ltd and are maker-marked on the reverse. 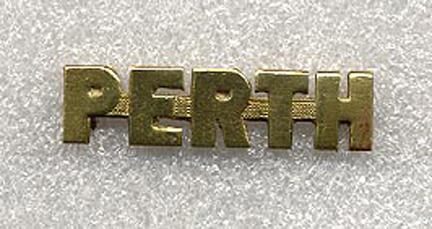 The 1948 pattern officers pattern badge mirrored the overall design or the other ranks pattern, but came in a couple of different finishes. The manufacture and detail of the officers pattern was far superior. The Maple leaf portion was also gold plated. It was common for officer’s to wear the other rank pattern for day to day use. 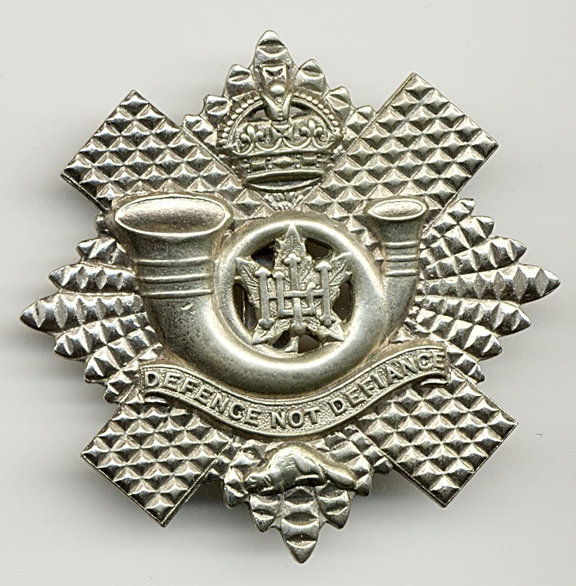 The Officers private purchase cap badge tended to be reserved for special/full dress occasions. It came in a frosted and non frosted version. They too were manufactured exclusively by Scully Ltd. 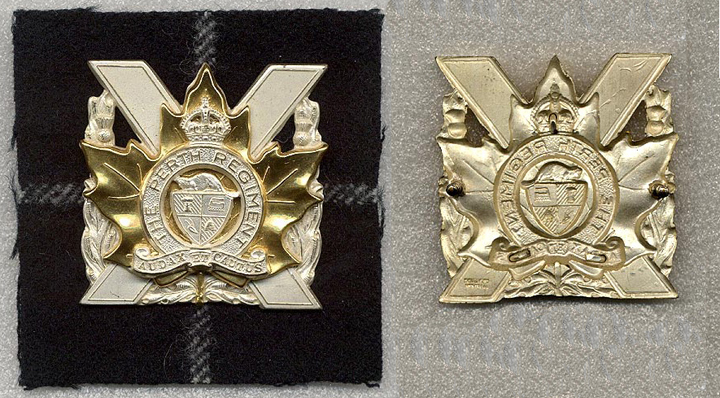 The overlay on the officers pattern is a separate piece pinned through the St-Andrews cross. 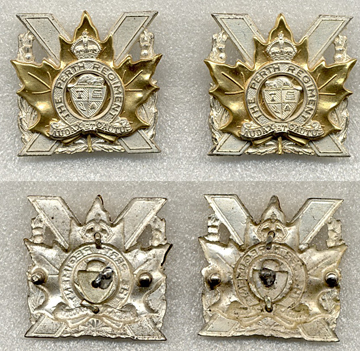 To date no examples of other rank collar badges have been found for the 1948 pattern badge. Following the war, there was no immediate return to a universal service dress that required the use of collars. At the time that the 1948 pattern badges were being designed, wartime pattern battledress was still in use. The adoption of the postwar pattern battledress with open collar did not require collar badges. Officers continued to wear service dress and officer pattern collar badges were designed. 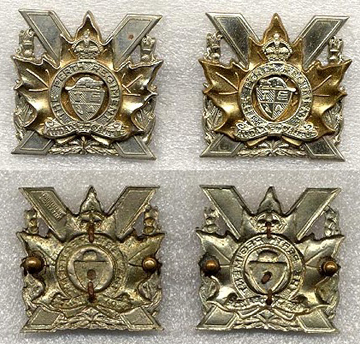 Unlike the 1920 pattern collar badges, these were designed with a left and right facing collar. As with the cap badge, they came in at least two finishes. The 1948 kings crown collar badges are fairly scarce. 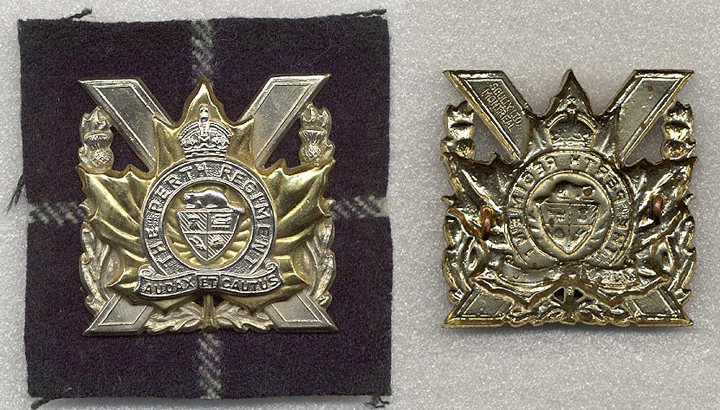 The last cap badge worn by the Perth Regiment came several years after Queen Elizabeth II ascended the throne. As is the tradition, the crown on cap badges changes depending on the gender of the reigning monarch. The Perths as a county militia unit were not a priority in terms of adopting the new crown on their badges and subsequently continued to wear the King’s Crown version of the cap badge. The first version of the Queen’s Crown cap badge was issued with a slider instead of lugs. The Perth Regiment along with some other highland units had some difficulties with the slider as it tended allow the cap badge to move while being worn. A request was made to have the cap badges recalled and have the sliders replaced by lugs. This was approved on 18 Mar 1963. The badges would be sent to Breadner Co Ltd in Hull Quebec for the modification. The was estimated cost 10 cents a badge. The 1948 pattern cap badge was reintroduced while this work was being done. In the post war period, Service Dress was often left to the individual units to decide upon. The cost of service dress was usually a personal expense . By the late 1950’s, early 1960’s service dress was making a limited return in some militia units. 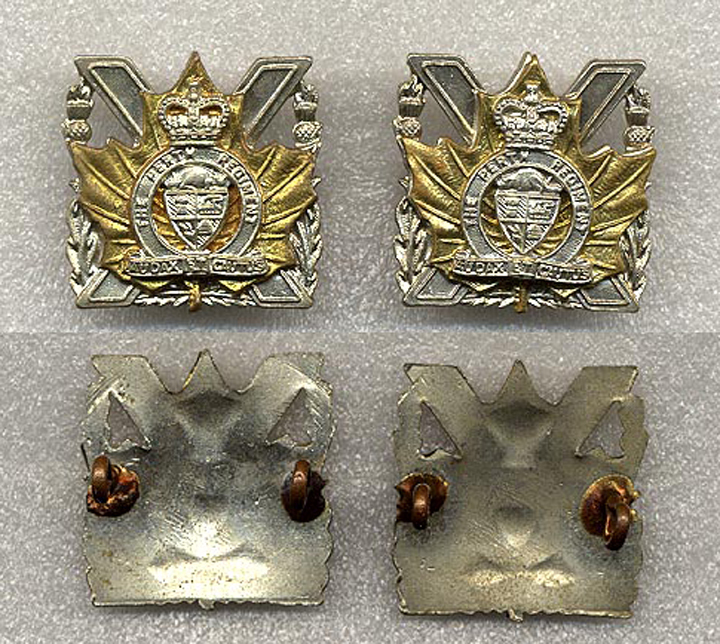 Similar to the 1948 pattern collar badges, a left and a right badge did exist with facing beavers. To date there are no known examples of Queen’s Crown officer badges. The 1948 pattern officer badges continued to be worn. A new brass title was adopted during this period to be worn on the service dress. It was much smaller than the Second World War pattern. As with the badges and collars , it was made exclusively by Scully. The 20 year period from the end of the war until being struck off strength in 1965 was a period of transitions for the regiment. Those transitions are well illustrated when one examines the insignia of the period. 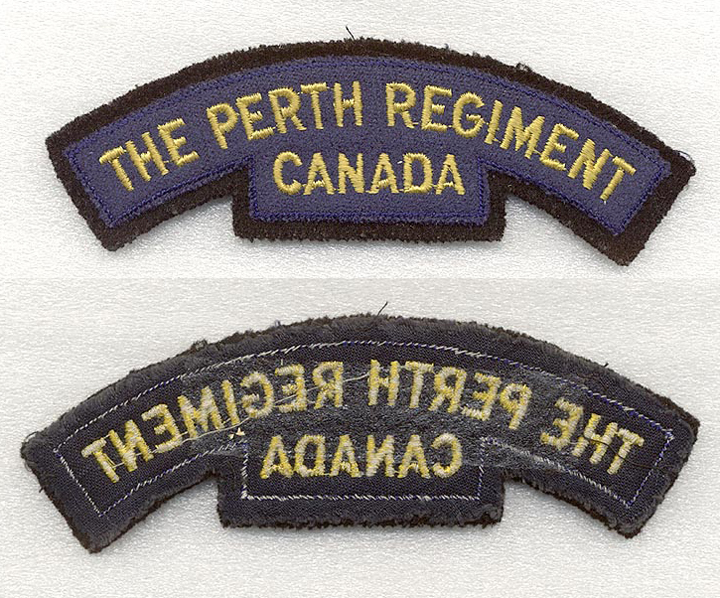 Following the return to Canada after the war, the insignia worn by the regiment consisted of what was worn during the war, including the 5th Armoured Division distinguishing patch. This practice ceased on Jan 1, 1947 when all distinguishing patches were removed from wear. Shoulder flashes continued to be worn. The first pattern of post-war title mirrored the wartime design and colours. Existing stocks of wartime titles would have continued to have been worn and it isn’t likely that new titles were ordered much before 1950. Based on remaining examples of this title, it was probably limited to a single run of titles. It is a scarce variant without a backing material. The second pattern of post war title had brighter thicker yellow lettering and can be seen in use in the picture of Capt McGowan above. 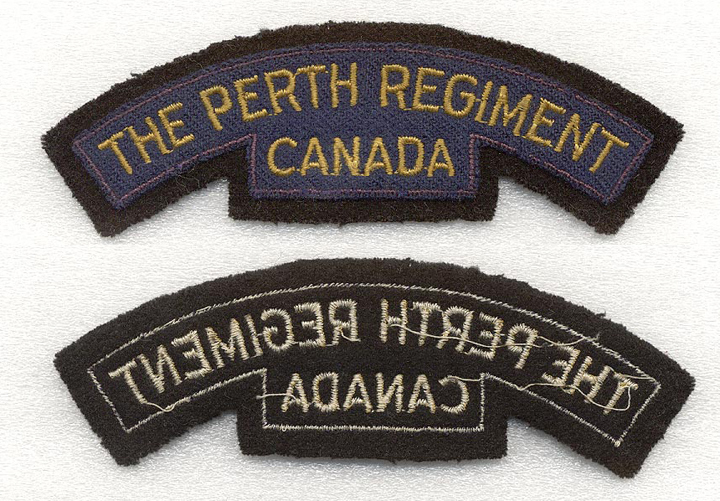 In 1954 a general reorganization of the Canadian Militia saw The Perth Regiment lose it’s individual identity for a thirty month period when the decision was made to merge the Perth Regiment with the neighbouring Highland Light Infantry in Galt. 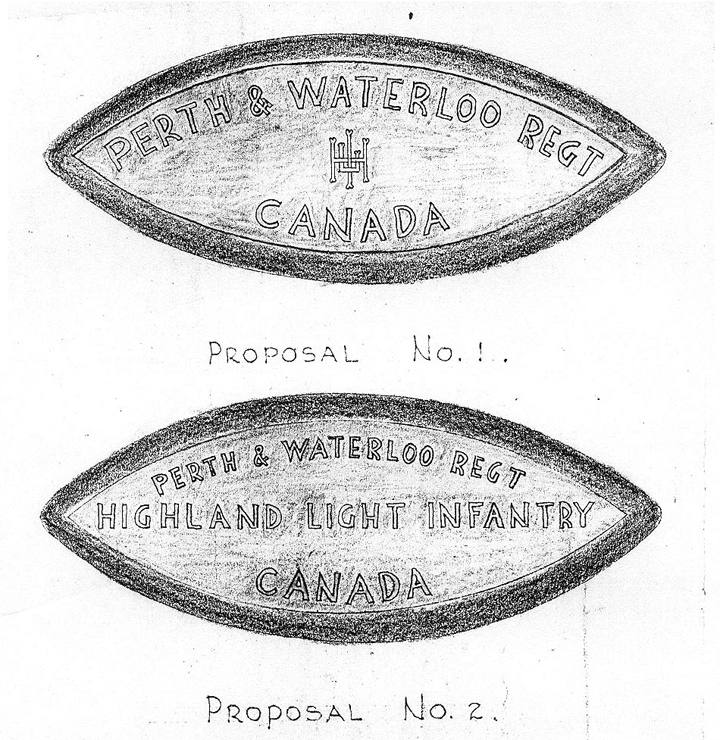 The cap badge for the new unit was to be the HLI cap badge but with the name Perth and Waterloo replacing the motto “Defense and Defiance”. The new cap badge never got past the design stage and was subsequently never worn. Both units continued to wear their respective cap badges during this period. The subject of cloth insignia however was developed beyond the planning stage and resulted in the creation of a shoulder flash that was worn for less than 1 year. During the initial discussions, it was decided that the HLI colours of Green and Gold would used in the basic design of the new shoulder flash. Several designs were created and declined as the officers of the HLI did not like how the cipher appeared on the flash. Finally a design was accepted and on 15 Feb 1956 it was approved. This forced merger was not popular with either unit and it was decided that it should be dissolved. The Perth Regiment regained it’s separate identity on April 1st 1957. Less than a month after reverting back to being “the Perth Regiment” a design was submitted and approved. This resulted in the 1957 pattern flash, a design that would be the last cloth insignia made for the regiment. Less than eight years later, the unit would struck off strength to the Supplementary Order of Battle.